Homer tries a new miracle hair growth formula and wakes up with a full head of hair. His new look helps him find fortune at work and pleasure at home but how long will it last? The Simpsons move into an old haunted house and are possessed to kill each other. 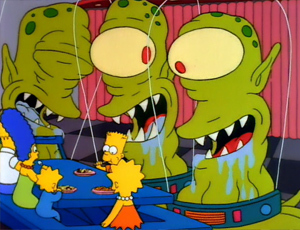 Kang and Kodos abduct humans for a feast. The Raven by Edgar Allan Poe is recited with familiar faces. 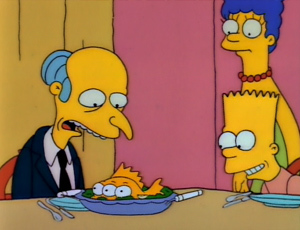 The Nuclear Power Plant is investigated after Bart catches a three-eyed fish in a nearby river. Mr. Burns runs for governor to save on paying costly cleanup regulations. 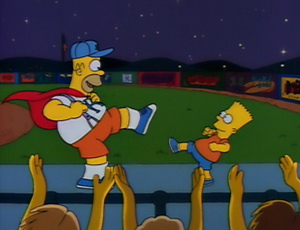 Homer becomes the dancing mascot of the Springfield Isotopes minor league baseball team. His popularity relocates the family to the big leagues of Capital City. 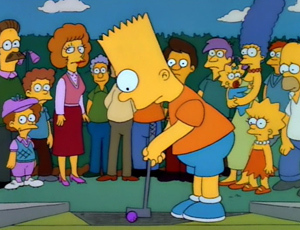 It's Bart vs. Todd Flanders in a miniature golf showdown after Homer and Ned make a bet to humiliate the father of "the boy who doesn't win". 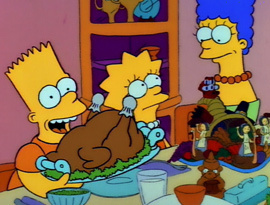 Bart upsets the entire family during Thanksgiving dinner and runs away from home. Life in the seedy side of town helps him realize how good it really was back at home. Bart watches a daredevil stunt at a monster truck rally and is inspired to become a skateboard stuntman. 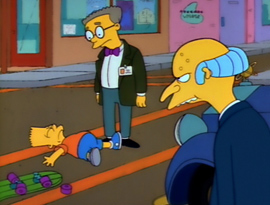 His success at minor stunts leads to an attempt at jumping Springfield Gorge. Maggie strikes Homer with a mallet mimicking an Itchy and Scratchy cartoon. 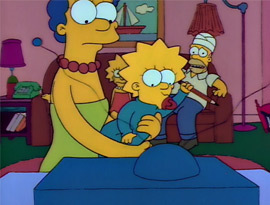 Horrified, Marge vows to put a stop to violence on children's television. 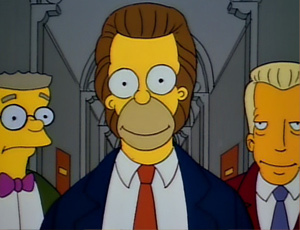 Homer is guided by a sleazy lawyer to sue Mr. Burns for a million dollars after he hit Bart with his car. An honest Marge is called to the witness stand to testify. 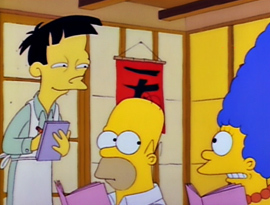 Homer is given 24 hours to live after eating a poisoned blowfish at a Sushi restaurant. He attempts to get all of his final affairs in order before his time runs out. 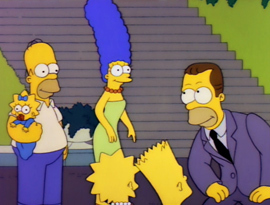 Homer and Marge recall the story of how they met after the family's television breaks. 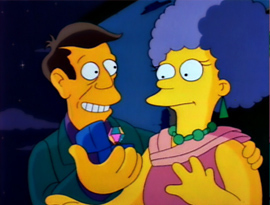 A young Homer attempts to get Marge to like him and attend the high school prom. Homer becomes the most popular person in town when he illegally obtains cable television. Lisa doesn't approve and fears he will be punished for violating a holy commandment. Principal Skinner romances Patty after Selma asks Marge for help with finding a husband. Bart uses his principal's loving state of mind to his advantage. Homer learns that he has a wealthy half-brother, Herb, in Detroit who is a car manufacturer. Herb asks Homer to work for his company and design a car for the average man. Santa's Little Helper is in trouble with the family after destroying their possessions and must pass obedience school in order to continue being The Simpsons' pet. Grampa falls in love with a fellow resident at the retirement home who unexpectedly passes away. She leaves him a large sum of money which he is unsure of how to spend. Marge returns to her hobby of painting and is commissioned to paint a portrait of Mr. Burns. 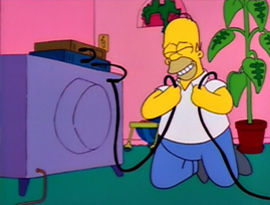 Homer decides to exercise after getting stuck in a water slide at a water park. 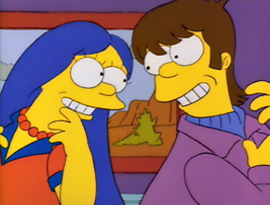 Lisa is inspired educationally and connects with her substitute teacher but is troubled when his teaching duties end. 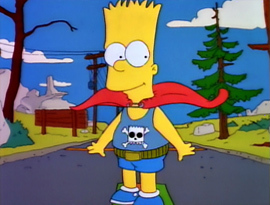 An overconfident Bart runs for class president. Marge and Homer go on a marriage retreat at a popular fishing spot after Homer embarrasses them at a dinner party. Grampa babysits Bart and Lisa while they are away. 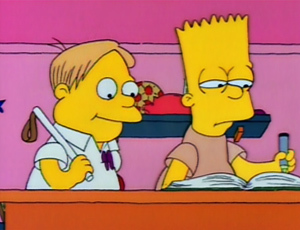 Bart, Milhouse and Martin purchase a Radioactive Man comic book. The boys spend a night in Bart's treehouse with the book which leads to more than they bargained for. Bart saves Mr. Burns' life by donating his blood of a rare type which they both share. Homer becomes upset and expects a reward worthy of saving his life.